Which missing people cases catch your attention? Are you more interested in cases involving missing men or missing women? Do you think the media covers too many cases, or not enough? How important is it to the storyline that Mark is the central focus of the case, rather than Madeline? What do you think about the use of face blindness as a character trait for Madeline? How does it contribute to her grief over Mark's disappearance? Were Madeline not to have suffered from prosopagnosia, do you think she still would have been attracted to Mark? What did they have in common? How might prosopagnosia hamper your own ability to function socially? Madeline seems to value her independence more than her Motherdid Vivian make herself a crutch for Madeline, especially with Mark? Why do you think Vivian really killed Marklove, hate, or jealousy? Have you or someone you know ever sold a wedding dress, or ever thought about it? What might make you do so? Would you ever wear a wedding dress worn by someone else? Would you wear Madeline's dress after knowing the circumstances of it never being worn? What do you think of the use of a TV newsroom as the setting for MISSING MARK? Does learning how a newsroom works make you distrust reporters or sympathize with them? Does the first-person insight into Riley's personal life influence your reaction? Do you think that it is a good idea for Riley to become so friendly with Madeline? From the beginning, Riley seems to be entering the friendship under false pretenses (just to get more scoop for her story), but as their relationship progresses, do you think that Riley really wants to be friends with Madeline? In turn, does Madeline need Riley as a friend just as much or more so than Riley needs Madeline for her story? 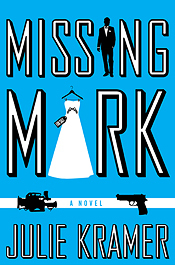 What is the significance of Garnett's re-appearance in MISSING MARK? Is he a missed opportunity or a regret for Riley? Do you think Riley knows what kind of relationship she wants with Garnett? What is your reaction to this romantic thread in the narrative? If one of the regular supporting characters in the Riley Spartz seriesNoreen, Garnett, Shep, Toby, Xionghad to be killed off, who do you think would be the most appropriate to sacrifice? Is it because you see a definite end to their plotline or do you think that their death would cause the start of another thrilling case for Riley? Does Riley Spartz remind you of any well-known news reporters or fictionalized investigative reporters? How do you respond to her tenacious reporting style? Does Riley's no holds barred attitude lead her into unnecessary trouble and comprising situations or is it what makes her so successful? Riley doesn't seem to have a lot of strong female friendships. At times, her relationship with Shep seems to be stronger than those she has with actual people. Do you agree? If so, why do you think this is so? Is Riley's career to blame? If you could choose a character in this book to be named after you, which would you choose? Do you particularly identify with any of the characters? Is there one you'd definitely not want your name associated with? In a mystery novel, how important is the "Why Done It" in a "Who Done It?" Does the disappearance of Big Mouth Billy Bass mirror Mark's disappearance in any way? What similarities and differences in motive are there? Why do you think animal cases are always on file with Riley? Do they carry more of a human interest factor? As you learn more about Mark's character, do you find that you are more concerned about both the well being of Shep and Big Mouth Billy than about Mark?